In the midst of an uncharacteristically dry winter anime season, Death Parade’s first episode was released to much fanfare, with viewers celebrating its darker tone, artstyle and a killer OP. However, despite a promising start, there was division on a crucial factor: emotional resonance. Given a subject matter, a series such as this relies on its ability to make the audience sympathise and feel the emotional beats for full impact to be had. Late last Sunday at some unearthly hour, Fruity Drinks and Nomadic Dec felt compelled to discuss at length the source of their opposing reactions to the episode. Subsequently, likely due to a cocktail of self-satisfaction and their clamouring for article clicks and validation from anonymous people over the internet, they have now decided to publish a transcript of their midnight ramblings online. Whether this was a fount of great critical dissection, the most regrettable thing ever committed to Kinja, or a mixture of the two is now for you to decide. Not that we care that much—you’ve already clicked on the article. In any case, we hope this is a sufficiently enjoyable read that provokes more critical analysis of the elements that make up a strong episode of anime. Nomadic Dec: I’m hoping the plotting for DP Ep 2 will be better though. But it was well executed. And the OP is killer. FruityDrinks: Wasn’t Ep 1 meant to be an establishing episode. Lay the groundworks and the tone of the show. Nomadic: Yeah which is why I forgave the plotting, because it did what it had to do to set things up. And it did it pretty well stylistically. The characters need to have more emotional resonance next week though. Fruity: That’s interesting, I personally thought that the first episode featured those sort of elements which normally gives an impression of a stellar opening episode. From what I’m gathering, while entertainment was available to be had during the episode, you felt instead that the narrative gave in for what might be “entry shock entertainment” and thus lost maybe purpose and flavour (because food analogies are the best analogies). Nomadic: Yeah but it wasn’t a condemnation of the entire show in this case or what it was trying to achieve. The tone and the setting were well-illustrated and conveyed, but the actual plotting of the couple’s story was poorly constructed. I am also looking forward to DP and I think it will be great, but the first episode, although enthralling, had flaws. Fruity: While personally I enjoyed the artificial tension, which is definitely taken for granted for some, it then built on what seems to be a human, realistic portrayal of circumstantial relationships between two. obviously convenient memory loss only to then suddenly regain portions of it back is more or less a sin, what it amounts to in terms of entertainment and the pay off, with the twists and turns of different viewpoints and as we watch the plot thickens, it’s a fair trade off. While I’m not defending DP first episode, because you’re totally entitled to your opinion, it was rather the way you put it forward that at first seemed weird to me. Nomadic: The plot in my opinion was predictable, but the tension created between the characters, as well as it functioning as a lens by which the main characters and world could be set up was well done. It was, as you put it, a fair trade off. However, the structure of the story itself was lacking. The memory loss and flashbacks not related to the accident (which is understandable), but rather the characters’ emotions, ought to have not been so out of the blue by the show’s own internal logic. To have full emotional resonance, there should have been more of a inkling (and not just the audience’s intuition). They were abrupt transitions in emotion and thus the flashbacks only served to push the characters from one emotion to the next, nothing greater. It may seem like nitpicking, but the series is bound to hinge on making the players’ stories compelling each week and so this needs to work better. Fruity: I probably incorrectly remember you saying there was too much ambiguity in the first episode concerning the couples and that you would prefer them to have fleshed it out so that we can have that emotional impact the show probably intended to. That’s cool personally I thought it was fine, because I feel in narrative we don’t all need to follow the same cookie cutter copy and paste narrative structure (though there’s a reason why it exists so you know, i’m probably wrong) but I feel like instead why does the show need to hold our hands to tell us the story about the couple? I liked how they handled it, they played on our assumptions, there’s accessibility to the show, there’s something that we already know, which is fantastic, and shows get praised for this. Sure it’s a relationship between a man and a women, it could be complex, but the fact we know they were engaged/married , we know the conventions of a marriage! what’s makes the relationship impactful, is that we start to understand both side of the marriage, and that we know how the marriage was form (i.e the arrange marriage), it’s foreshadowing it, it’s leading us on, trying to betray our assumptions of how happy this married couple really is, the whole baby situation. It’s maybe trying to illustrate how shallow their love is, or how shallow humans can be, one had simple ambitions of raising a happy family, while the other wanted a cozy life. Which is why the fragmented memories and the perspective switcheroo was really intriguing!! So while i understand that while maybe you prefer more clarity in narrative, i feel DP actually benefitted from having something more abstract, more shattered for lack of better word, because if the shows about putting humans to “tests” or “games” in a more thematic way to address these motifs that maybe the show is about(i could be totally wrong, i know nothing past the first episode of DP) So personally, I feel this style of narrative storytelling is actually more benefitting, because maybe the show wants us to pick sides and pitch our emotions, our feelings against the other characters, and maybe that’s why I felt i found less flaws then you did. Nomadic: Firstly, it wasn’t the ambiguity of the piece that was an issue or that I wanted more clarity. Any psychological story worth its salt has ambiguity and I agree that the story, though predictable, did actually some rather enthrallingly ambiguous characters that were totally absorbing. The voice-actors aided this immensely - some pretty great work. Likewise, inventive storytelling is crucial, as the proliferation of dull, average stories throughout most of mainstream media illustrates. Perhaps because we are in a cynical age of entertainment where we are aware of tropes and story structures, combined with a lack of ingenuity generally, I guessed the narrative of the entire episode once the dynamic had been established. I was hoping for the episode to defy my expectations narratively, go a bit deeper and so I was a bit disappointed. That said, as you rightly point out in the middle of your critique, it does expertly play on our knowledge of marriage and relationships and I agree that the changes in perspective did contribute fantastically to illustrating the unravelling of their relationship as the game continues. However, I think certain emotions (particularly on the husband’s part) could have been shown more organically. It is clear that aside from memories of the accident, the couple has retained most, if not all of their memories based on the fact that they remember one another and their pre-existing relationship. The majority of flashbacks therefore—while new to the audience—are not new to the couple. They may have moved to the forefront of the mind (when we see them), but they were not lost. The flashbacks aside from those pertaining to the accident do not serve as shocking revelations or sudden memories for the characters themselves. Of course one could argue that they guised their true feelings for appearances, but given, for example, how the husband was acting with wholehearted self-sacrifice pre-wedding flashback and then suddenly turning to rage afterwards, it came off as emotional whiplash rather than a true emotional transition. You could say that because emotions are by their very nature irrational or instinctual it makes sense, but even then there would be at least a subtle indication previously. It could be that I didn’t pick up on it, but I like to think that I would have. I chalk it up to the runtime being insufficient for the emotional build to work naturally and so the flashbacks served as an interesting manner to move the characters quickly through the required emotions for the story to work out. Perhaps even just giving the more emotions time to breathe would have heightened the emotional impact. That said, the story sufficiently allowed for all of the other elements—particularly the atmosphere—to fall into place and they pulled that off with panache. I still think DP Ep 1 was highly enjoyable and I’m certainly excited for the rest of the series, but perhaps for stylistic reasons and my interest in Decim (who in a few lines had greater emotional impact than the couple) and the other arbiters/staff than the story this time around. Fruity: You know in the end, it’s goes down to personal preference in narrative styles. I’m more David Fincher, you’re more Martin Scorserse. I think we can agree to disagree on how we want our sandwiches made, but we both butter. I too can’t wait for more Death Parade, it’s definitely going to be one for us and everyone else to look out for, probably if it wasn’t hyped up enough. Fruity Drinks and Nomadic Dec wish to express how thoroughly they enjoyed this discussion. 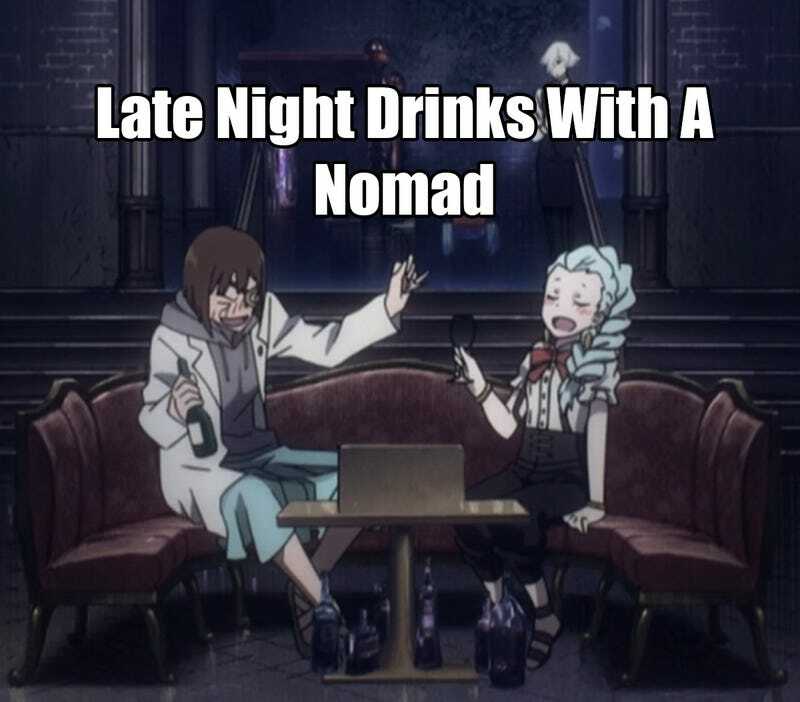 They also really like the name “Late Night Drinks with a Nomad”. If you’d be interested in reading any more of these types of chats, they’d appreciate some sort acknowledgement of that fact, so that your feeds aren’t mistakenly proliferated with articles that you don’t want. Then again, they might do it anyway, because not everything can be a list. This isn’t Buzzfeed after all.